Although I wrote everything I know about squirrel issues for this website, oftentimes a problem with squirrels in the attic is beyond the scope of the do-it-yourself homeowner to solve. I have found a professional company in Houston, Texas that handles problems with wildlife. A All Animal Control has access to tools, techniques, and experience that help them do a far better job at wildlife removal than a non-experienced homeowner could. They possess licensing that allows them to do certain types of work legally, that non-licensed homeowners in the state of Texas are not allowed to do. For the welfare of your situation, and the squirrels, in some cases it's best to hire a pro. There are good companies and bad companies out there. I've done research on such companies, to get to know them, and feel confident recommending their services. I therefore recommend a company called A All Animal Control which services Houston, Texas. If you have a squirrel problem, or any other conflict with a wild animal, and live in Houston, I am confident that this company, A All Animal Control, is the one to call. I asked the company to describe their service range, and they said this - We service the Greater Houston area, including the towns of Jersey Village, Aldine, Friendswood, League City, Texas City, Pearland, Missouri City, Sugar Land, Mission Bend, Bellaire, Hedwig Village, Katy, Richmond, and Rosenberg, and more. A All Animal Control operates 24/7, so don't hesitate to call at any time to discuss your wildlife problem, and schedule an appointment for same-day or next-day service. Hi David, I have just finished reading information on your website about squirrels in the attic. Unfortunately, I have the same problem or worst as your other readers. Let me apologize up front for the length of this email. My intent is to give you much detail & background to understand our story, agony and stress level. My husband & I are at our wits end with what we think are squirrels in our attic. We have been trying to resolve this issue since last June....yes June 2009. The money we've spent on so called professional animal trappers is unreal. We are at the point of walking away from our home. I've left a few times to stay with my mom and will be returning shortly; its just that bad. The problem: We can not for the life of us & others find any type of entry point nor any urine or feces to show something is really there. However, we know its some type of animal because it destroyed our insulation and ducts. Insulation was ripped all over the attic and ducts torn. So, thinking if we removed all the insulation, it would give us a better chance to find the creature, well it didn't work, its still here and we still have no insulation...no more money. My husband walked the entire outside of our house and sealed everything that remotely looked like a hole. Every professional has commented on how good of a job my husband did. They also stated they are just as puzzled as we are because they too could not find an entry point, but agreed its some type of animal. They have all guessed..rats, possum, etc. We've had roofers out..found nothing, tried video taping,..still nothing. We could hear it on the tape but, again didn't see anything. As soon as we open the attic door, it gets quite....frustrating. Hello David, I read your article on squirrels making their homes in residential attics and the various ways to correct the problem. First let me say that your article was thorough and well written. I gained a good deal of valuable information from it. I have at least one adult squirrel in my attic. I saw it enter through an attic vent. I have decided to use a professional to remove the animals. A few years ago I had a similar raccoon problem. The company that I had come out to give me an estimate just wanted to set ground traps and charge by the number of raccoons that they trapped. This didn't seem like a valid method to me as there are many raccoons near my locale. I was looking for someone to take care of my attic raccoons not to clear all the raccoons in my neighborhood. Needless to say I didn't hire the company. I jested waited and one day I saw the mother and four babies exit the attic. I was ready for the day and immediately good went into the attic and steel wired the opening. Problem solved. Can squirrels and raccoons co-inhabit an attic? One final question: Do you know of a good company that you might recommend in the Houston Texas area? Thank you for the great article and for any information that you might provide. If you have a squirrel problem in Harris County Texas, or any other conflict with a wild animal, I am confident that we can solve it. 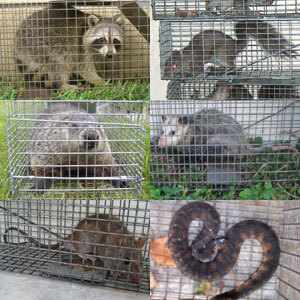 We use humane methods when dealing with Houston wildlife removal situations. Squirrel Control Houston. Our company is fully licensed and insured in Texas. Call us any time at 713-244-6679 for a price quote and to schedule a same-day or next-day appointment to solve your squirrel problem in Houston.